Flower Shop theme design flourishes with beautiful colors and neat elements – a perfect flower boutique and decoration shop. This flower store theme will make your life easier by letting you create an online store easily and fast. If you are into floral design and need a bouqet shop, or create decoration for weddings and home and need a gift store – this is a perfect solution for you. Expose your floral and decoration work with a great portfolio, blog about flowers and handmade decor, create a flower boutique – and do all this easily and with pleasure. Flower Shop theme seems to be very clean and feminine, yet its functionality is amazing. A powerful WooCommerce section makes this florist WordPress theme a super-functional online store for flowers, decoration and gifts. Custom Admin panel – we have greatly extended initial WordPress admin to provide you with more functionality that includes a wide variety of options and settings and provides maximum customization flexibility to help you create a flower shop and florist boutique website. Layer Slider & Revolution Slider – this flower shop and flower boutique theme for florists and decoration stores comes with two popular slider plugins included, a Layer and Revolution Slider, both have supreme functionality and breathtaking effects. No need to purchase them, it’s all in! Custom Form Builder Tool – Cmsmasters team has created a custom form builder tool that lets you create project applicaion forms and other contact forms on your cv or resume website. Responsive Layout – Flower Shop – Florist Boutique & Decoration Store WordPress Theme has a responsive layout that will respond to your screen width and make content appearance be perfect on all devices, from large desktop screens to mobile phones and tablets. Retina Ready Theme for WordPress – Retina displays set special demands to websites, and Flower Shop theme is developed to have an ultimate performance on all retina displays, providing premium presentation quality for your website elements. 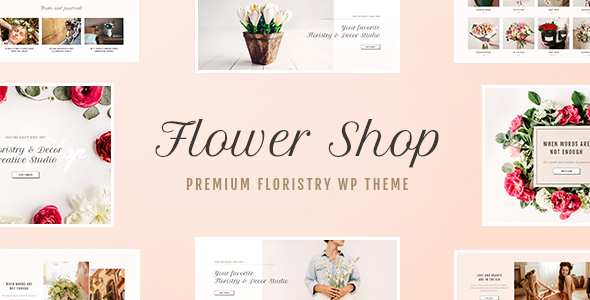 If you need to create a flower store and bouqet shop, floral design and decoration store , gardening or a gift shop website – Flower Shop WordPress theme will do the work for you.